Oh but don’t you worry! Purina had a perfectly good explanation and said these worms are ‘likely’ Indian Meal Moth Larvae. I don’t believe that for a second. Why don’t I believe it? Because it KEEPS ON HAPPENING and they don’t seem to care. However, they are making it a point to say that these worms are harmless. Perhaps Purina executives should regularly have their meals sprinkled with this larvae, I mean it won’t hurt, right? In the end, Purina said they were issuing Bradley Terry a refund. Bradley says he’s staying away from Purina altogether. Can’t say we blame him. Have you ever found anything this disgusting in your dogs food? Today, 6/6/2018 I found live maggots in my Purina pro plan puppy food . I had read about this and had checked my previous bag of food. What do I do now ! Unfortunately, Purina doesn’t look like they will change their ways. I recommend you either switch commercial dog foods or even to a homecooked diet. Home cooked meals are a hassle at times but at least you know what is inside of it. Keep us posted. Lots of maggots in my cats canned pro plan wet food.. very upset. it’s 1/4/2019… 🙁 i’m so upset! Just found a ton in our Cat Purina Pro Plan Savory Shredded Chicken Blend (the Chicken & Rice flavoured one) So it was pretty much the exact same brand/flavour as others have had this issue with only ours was in our cat food. It’s so disgusting!!!! As a manager for a major pet store chain, I would recommend that no one buy any Purina brand food at the moment. Their lack of care on this issue has not only cost our store thousands of dollars in lost food and now moth treatment by our pest company, but also cost us in valuable customers that are mortified to have bugs in their “babies” food. I would not feed any Purina to my animals and don’t recommend it to any customers now. P.S. Stay away from all of their brands, not just the pro-plan. Wow. Thanks for commenting and speaking up Ryan! And again….this is still happening! 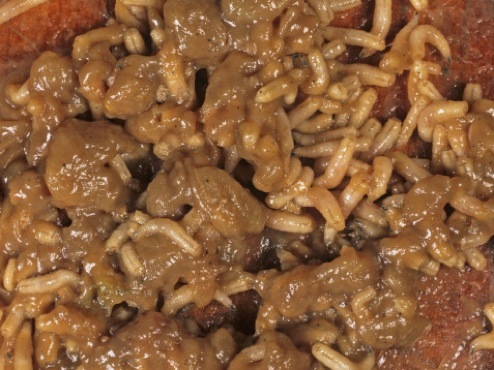 Inside the actual nuggets of food— live maggots! Every nugget my daughter broke open this morning had these creepy crawly insects. Google search indicates documented cases going back 10+ years. Stay away from Purina. 12/28/18 – Found them in a bag I bought yesterday. Immediately reached out to PetSmart and Purina. Sent photos and video. I will never purchase that product or any other Purina product ever again. Purina Pro Plan was recommended by my vet as the best alternative to the grain-free food I previously fed my dog. Since the vet recommended it, I purchased the food without extensively checking for issues or recalls. I had never purchased Purina food previously – and never will again! Upon opening the bag, I was greeted by slimy white maggots with their myriad relatives in various stages of emerging from most of the nuggets. Totally disgusting – and unbelievable that Pro Plan ranks near the top as the most recommended dog food by vets. Shame on them! I recently was cleaning out the small closet I keep my dog’s food in (nothing else but brooms, stuff like that, no food). As I was cleaning the floor, I noticed tiny bug shells. Then I saw live maggots under my dog’s food bin. I checked my ENTIRE kitchen, food, everything and they were NOWHERE else. I searched the bag of Pro Plan and did not find any, so I started reading wtf are they?! Yeah, then came across they were found in the dog food! So who knows how long they’d been there or which bag they came into my home in. I called pest control the next morning and he agreed they came in the dog food. I took the open bag of food back to Petco and was given a full refund. I didn’t even bother contacting Purina based on the reviews I read. I ordered a new food container with a screw on lid (no bugs are getting in that sucker!) and I had to change my dog’s food. I chose Taste of the Wild based on consumer reviews. But SO many reviews of the bugs in Pro Plan! DISGUSTING!